The hub of the collection is the Red Velvet Knit Dress, and this is my second make from it. 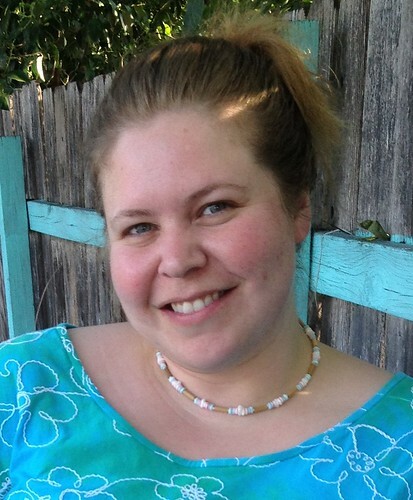 I used a medium-weight cotton/spandex jersey (no longer available) from Girl Charlee. It’s lovely stuff, so soft and comfy, excellent recovery. Using a fabric like this does come with its risks though, because of the lengthwise stretch. My bust length is about 2.5″ longer than bodice front, so the pattern directed me to lengthen it, but I didn’t… I thought the lengthwise stretch would be sufficient, and I didn’t want that underbust seamline to stretch too low as I wore my dress. This thinking turned out to be partly correct and partly not. I’m asking a LOT from that stretch, and it’s causing some draglines. Next time I’ll add about 1.5″ in length, and just trim some out during fitting if it’s too much. Like the Cake Patterns for knits that have come before, this one has kimono sleeves, which I have to say I’ve gotten quite addicted to. While I don’t mind setting in sleeves sometimes, it’s awfully nice not to *have to* in order to get a good fit. It took me a make or two to get them tweaked to my liking, because I realized I needed a little more room at my upper arms. I didn’t want to lower the top of the side seam because I like a closer fit there, for mobility and just because I find it more comfortable. So what I finally figured out is that I could widen the angle at the shoulder point so that it was cut straighter out, and that worked brilliantly. The directions specify to staystitch the circular neckline, and no kidding on that, it’s important. I did it right away with my first make and it did the trick. But in a couple of these pics, you can see the center front of this one is ever-so-slightly stretched out. This is because I didn’t do my staystitching right away — I handled the bodice piece quite a bit before remembering to do it. D’oh. The pattern comes with this cool little ticket pocket thing, that’s hidden in the waist seam using an invisible zipper. I made it on my first test, and it came together perfectly (even though it was my first time to put a zipper into a knit). However, I adore the pockets in the Tiramisu, and I wanted to use them with this version. 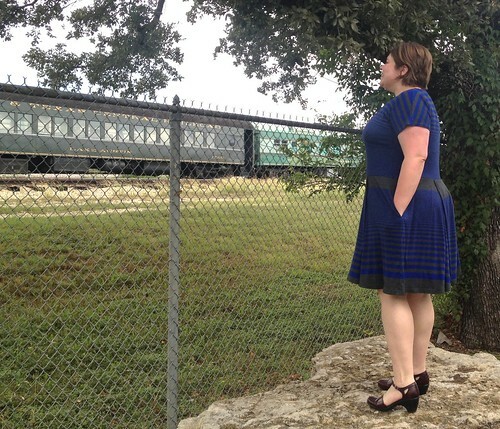 I know it messes with the profile of the dress a little bit, but this is an everyday wear for me, not a formal thing. And I love to have pockets for my hands! I just made the marks for the pockets at the same placement as they are on my Tira pattern. ETA UPDATE: The Muses that tested the pattern shared lots of fitting, styling, and sewing experiences here! Yeah! I love this dress (as I knew I would as soon as I saw the words “Red Velvet” in your post). 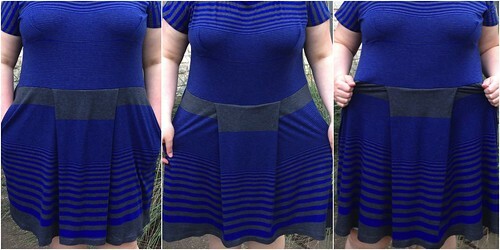 I LOVE the ombred stripe fabric you used here, it’s such a cool effect with the pleat! 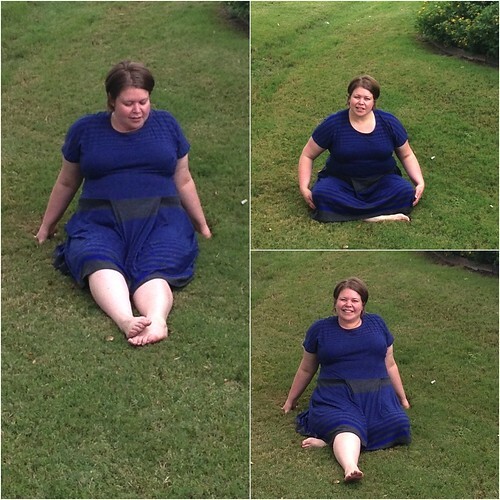 Great post, thanks for showing off the boxy (rhymes with foxy) pleat! :) Thanks for all your hard work on bringing RV together. Thanks Steph :) Sometimes I struggle for a while over the fabric I choose for a project, but this one clicked for me right away. And I’m SO calling it a foxy pleat now, love that! Looks great! Thanks for the tip about widening the kimono sleeves, I added to the tiramisu sleeves but then the armhole was too low so I’ll do your trick on the Red Velvet! I love that you’ve put side pockets in too! Thank you Suzy! I tried it on a lark and was really pleased with how it worked. I’d love to hear if you like it, too! Great dress with great fit! It’s beautiful! I’m making one this weekend.I also had doubts about the boxy pleats but you’ve put my mind at ease. Now I just wish my fabric would dry so I could get started! I’ve just joined the group! My fabric is finally dry, my pattern is taped together, and I’m ready to cut, but I need to decide whether to add width to the hip area or not. I’m cutting a 47.5 waist, but in big 4 patterns my hips are usually 2-3 sizes larger than my waist size. How did you find the fit through the hips? Thanks for the info. I’m 56″ in the hips. I graded out, figuring I can always take it in if needed. The bodice has come out very nicely, now just to see how the skirt goes! 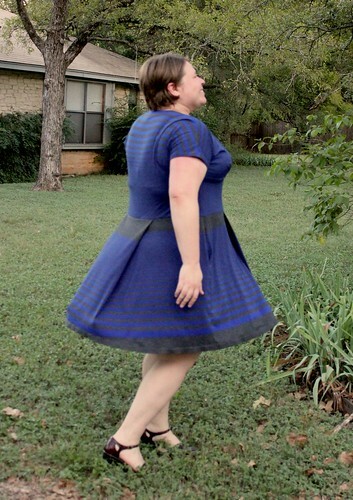 I think the 47.5″ skirt as drafted would work just fine for 56″ hips, but you’re absolutely right, it’s much easier to take it in vs. add more room later. I’m so excited to see yours! I love the dress- it looks fabulous on you. I think it is the best thing I’ve ever seen you make. And can I say I love the pictures. You look so happy! the dress looks great! good to know about the not-a-box pleat. love that fabric too! Ohh, neat! I really love the shape of this dress! You’re tempting me to try it out! Susan this is a wonderful make! I have the same issue with upper arm pieces typically being too small but I didn’t fully understand your explanation on how you fixed it. Any chance you can expound on that or provide a tutorial? Ditto. I guess you’ll talk about this on Tuesday when we all get together? Oooh – it looks great on you! I love patterns that are wearable everyday dresses. This one turned out great and looks very comfortable. 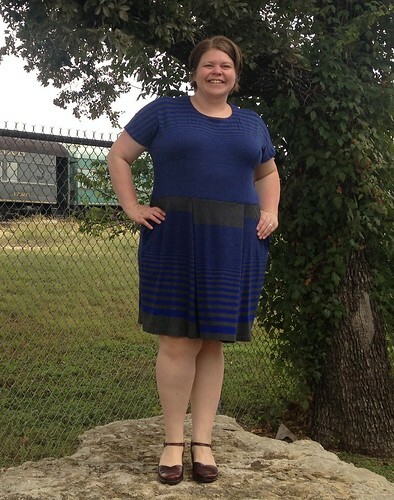 Love your use of stripes here, especially in the bodice. Almost has a macaron style yoke going on. Great location for your photos too! My only little nitpicky comment about this one is I’d like to see you raise the waistline by an inch or so. I think the proportions would look just a little better. Love the length of the skirt though. Very flattering length for your legs. Oh, I didn’t see that yoke effect until you said this, but you’re totally right! Very cool. And I agree on the waist, that’s a good point. I think this is another consequence of the lengthwise stretch actually, because it’s at a better spot after it’s first washed. Good to know though, because I love spandex blends and that almost always comes with a bit of 4-way stretch, so it could be an issue again… :) Thanks girlie! 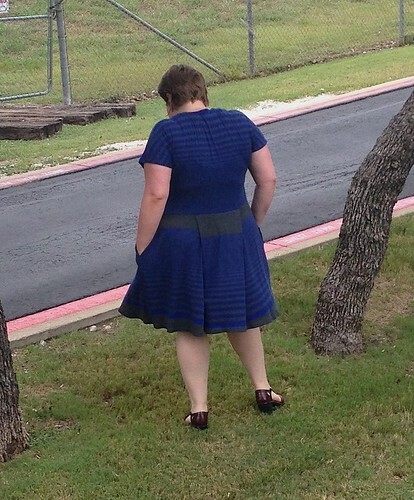 A lovely dress Susan. Very pretty. You have done a great job. I have been on the fence about the red velvet because of that pleat, but you may have me convinced. Now the leggings and jacket I am dying for. You are going to make me bankrupt with your awesomeness! The dress looks amazing on you. Looks great, Susan. I’ve been waiting to see your version before I decided if i wanted to buy the pattern or not. You know I love a good knit dress, but how many patterns can a girl have (I’m sure I know what you would say about that). Plus, I’ve struggled with fitting the kimono sleeve bodice in the past, but I think it would be easier to get right on this pattern, as opposed to the Tiramisu where the v-neck complicates things. Hmmmm…. still debating….